A good friend recently said to me that the thing she loves most about Hallmark Christmas movies is that for two hours (with commercial breaks, of course) you can check out of reality and forget about all the difficult things going on in the world, and just remember the loveliness of the holiday season. After all, there is nothing wrong with escapism when it involves Christmas miracles, snow, and hot cocoa. Here’s the thing about Hallmark Christmas movies: they always follow the same formula. It’s one of a handful of plotlines: ambitious city girl goes back to her small hometown for the holidays, where she runs into her ex and remembers who she truly is; Christmas non-believer learns the true meaning of Christmas and falls in love in the process; single-parent has to move back home to care for an ailing family member and is reunited with an ex, who turns out was their soul mate after all (this theme will be important). And, they always include the same essentials: hot cocoa (really, Christmas-theme beverages of any persuasion), decorations to the max, snow and snowballs fights, near-miss kisses, and the resurrection of an old love interest. Predictable as they may be, they never fail to remind viewers of the magic of the Christmas season. 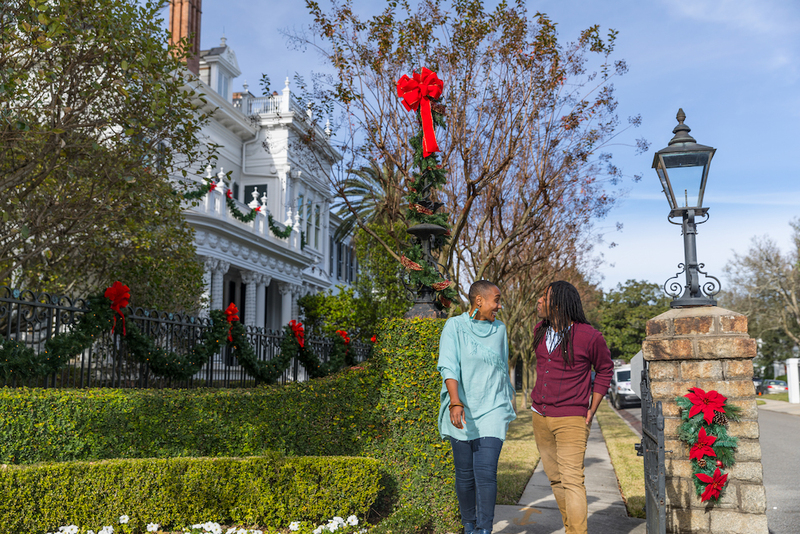 The holiday season is in full force, and New Orleans is prepared to let us live out our best Christmas lives just the way Hallmark movies taught us to – only without the cheesy background music and Candace Cameron-Bure, but with a few more cocktails and New Orleans twists. One of the true trademarks of the Hallmark Christmas movie is that the Christmas decorations are borderline extreme, and there’s always one non-believer who gets disparaged for not having any decorations. Don’t get dissed, get the proper décor. 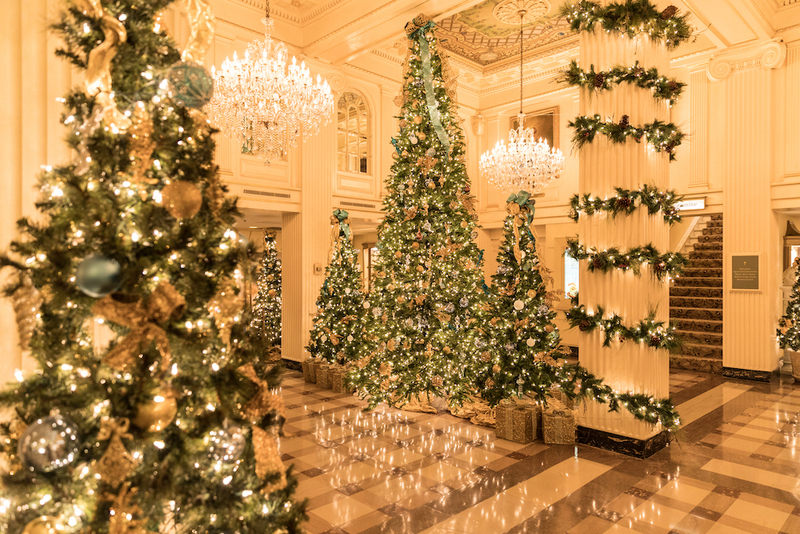 For ornaments and smaller, yet sophisticated, Christmas touches, visit Hazlenut (5517 Magazine St.) or the Roosevelt Emporium Gift Shop at the Roosevelt Hotel (123 Baronne St.). They both have a wide selection of ornaments to meet everyone’s needs. For your larger and more natural decorating needs, check out Dunn and Sonnier (3433 Magazine St.) – they are the best in town for floral arrangements and garlands of any kind. Santa’s Quarters (1025 Decatur St.) in the French Quarter is open year-around and is basically Santa’s workshop, if Santa were a die-hard New Orleanian. The store carries Christmas decorations that meet the needs of every jolly-die-hard-Saint-Mardi-Gras-Krewe-riding-crawfish-peeling New Orleanian…or just the fans of those things. For decorations that are less traditional and more it’s-Christmas-so-let’s-make-it-fashion, visit Perch (28844 Magazine St.) for unique, fun and eclectic décor. Not having a real Christmas tree begs the question, “ Are you really even celebrating, if your tree is fake?” I am not here to judge, because my black thumb and I are owners of a very plastic, very fake tree. However, the people in the Hallmark Christmas movies are here to judge, so make sure your tree is very real and smells of fresh pine and Christmas miracles. There’s something very festive about walking the aisles of lined trees, feeling the needles and smelling the pine. Added bonus: shopping local during the holidays is just the antique, heirloom angel on top. Bring a festive beverage (more on that below) to complete the experience. Urban Roots Garden Center (2375 Tchoupitoulas St. and 1835 Canal), Harold’s (1135 Press St.) in the Bywater, and Perino’s (3100 Veterans) in Metairie are all local favorites with friendly staff, fresh selections, and delivery for those who don’t have the family car from Christmas Vacation. If we’re doing this right (and we are), then we can only consume Christmas-worthy drinks during the entirety of December. This means hot cocoa, eggnog, and cocktails with candy canes sticking out of them. Hallmark movies always contain a variation of the three, because water is for non-believers. However, let’s not forget that this is New Orleans, which means we aren’t drinking just any ol’ Swiss Miss hot cocoa. Visit Willa Jean (611 O’Keefe Ave.) for their peanut butter hot chocolate or try the white chocolate lavender hot chocolate from Sucré (3025 Magazine St., multiple locations). If you’re more of a purist, the hot chocolate from Café Du Monde (800 Decatur St.) doesn’t come with any extra frills, but it’s made with condensed milk, which makes it extra creamy and rich. 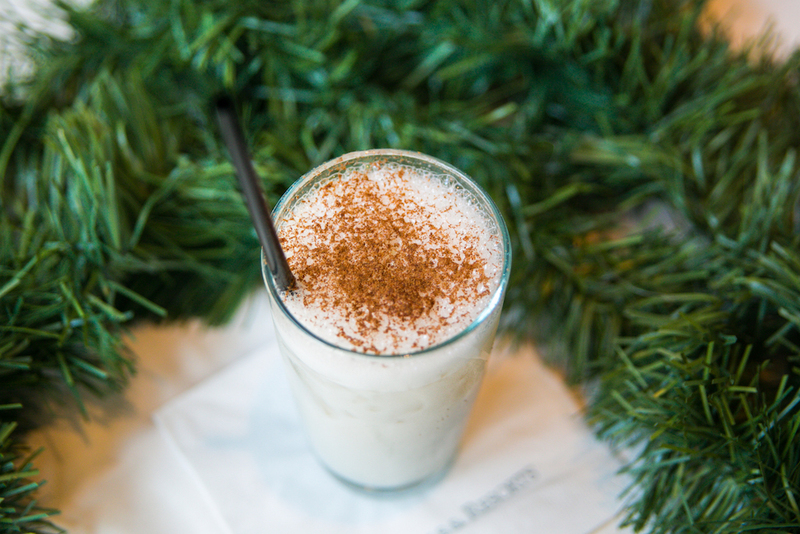 For those who want a more “celebratory” drink, try the Cajun Christmas (eggnog latte with brandy or rum) or the Southern Solstice (maple spice white mocha with Jameson) from Envie Espresso Bar and Café (308 Decatur St.). And for an eggnog that can only be found in New Orleans, try the frozen eggnog daiquiris from New Orleans Original Daiquiris (multiple locations) or the Eggnog Snoball (topped with topped with Bananas Foster) from Hansen’s Sno-Bliz (4801 Tchoupitoulas St.), because you really never know what the weather will be like for Christmas in New Orleans. For cocktails that may or may not be garnished with a candy cane, check out the seasonal drink offerings at all the classic New Orleans establishments, which you can find more on here. You might be thinking: how can I live out my most Hallmark Christmas Movie life without the fluffy white mounds of crisp, suspiciously white snow, or a snowball fight with some adorable children, or a long-lost high school sweetheart, if I am in the subtropics of New Orleans? We’ve got you covered. On Saturday, Dec. 1, the South Market District (611 O’Keefe Ave.) will be hosting South Market Snow during the Krewe of Jingle Parade. From 11 a.m. – 3 p.m., there will be live music, food and drink specials, discounts from South Market retailers, and (most importantly) SNOW! A realistic snowfall will be replicated using artificial snow, provided by the same kind of machines used in Disney World, which seems pretty legitimate. 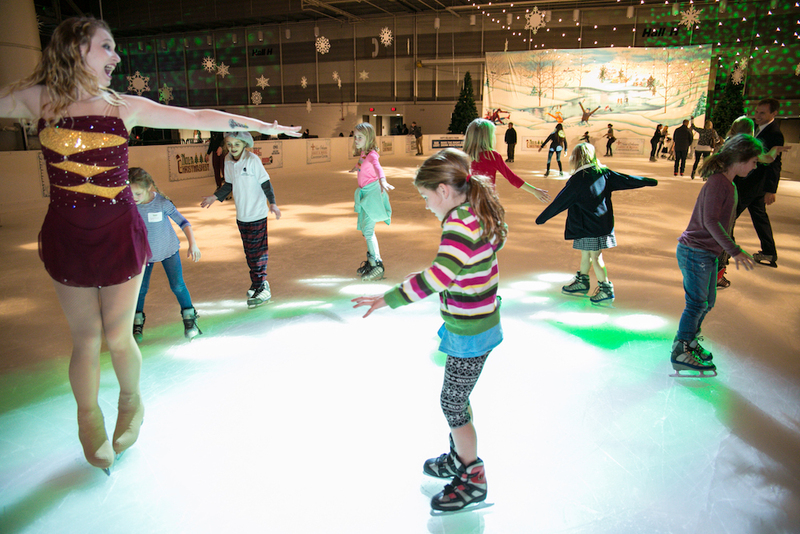 For ice skating and an indoor “snowball” fight, NOLA Christmas Fest (New Orleans Convention Center) runs from Dec. 20-31, and includes rides, games, and an ice skating rink. Run-in with an ex from high school. 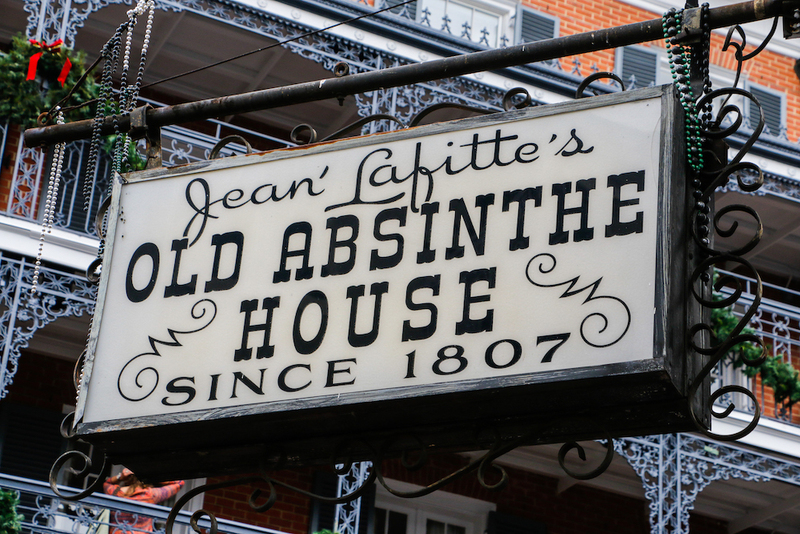 If you’re from New Orleans, this town can seem pretty small – almost as small as the quaint towns featured on every single Hallmark movie – so avoiding running into an ex (or basically anyone) from high school is almost impossible. One of the most essential requisites of the Hallmark Christmas movie involves a run-in (and inevitable rekindling) with an old flame from high school, so if you want to ensure that this happens, visit one (or all) of the following: F&M Patio Bar (4841 Tchoupitoulas St.), Gold Mine Saloon (701 Dauphine St.), Old Absinthe House (240 Bourbon St.) post lunch on the Friday before Christmas, or any Walgreens in Uptown New Orleans. Also, keep these in mind if you are trying to avoid any unintended reunions with your ex. Secure the ex, and get ready for a near-miss kiss. Hallmark movies are beyond wholesome, so there needs to be a near-miss kiss to add a little conflict and anticipation. It’s always somewhere adorable and Christmas-y, preferably with some lights and a crowd to make things extra awkward. There are plenty of light displays, events and romantic settings all over the city – with a sufficient crowd – so you can try them all in the hopes that one of the near-miss kisses will eventually turn into that romantic, happily-ever-after moment. 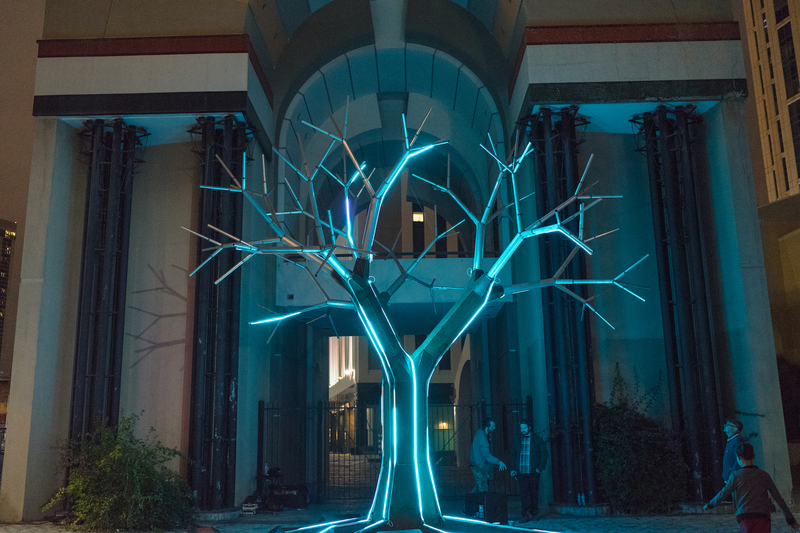 From Dec. 6 – 9th, LUNA Fête will run each evening from 6-10 p.m. at Lafayette Square. The annual, multi-platform art installation includes a series of music, graphics, and lights that tell the story of New Orleans as it is projected onto Gallier Hall. If the near miss-kiss turns into a real one, get tickets to the Sonder Luna Lounge for a VIP experience that includes cocktails, food provided by Leblanc + Smith, and a little privacy away from the crowd. Other ideal near-miss kiss venues include Zoo Lights at The Audubon Zoo, Celebration in the Oaks in City Park, Miracle on Fulton Street, and The Roosevelt Hotel lobby. Take in the sweet sounds of Christmas carolers. What kind of grinch would I be if we didn’t include Christmas carols? 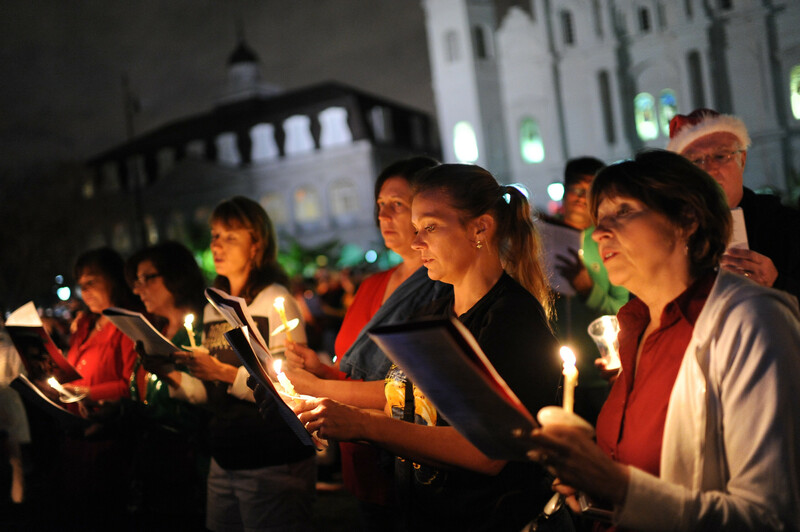 On Sunday, Dec. 16, New Orleanians assemble in Jackson Square to sing Christmas carols while overlooking the St. Louis Cathedral in the French Quarter. With the warm, candle-lit glow illuminating Jackson Square, this is one of the most magical and genuine Hallmark-worthy experiences. Candles and song sheets are provided, so arrive with those vocal cords warmed up, as the singing starts at 7 p.m. For some less sweet and more boozy sounds of carolers, join the Fourth Annual Streetcar Pub Crawl on Saturday, Dec. 1. Revelers meet at Cooter Brown’s (509 S Carrollton Ave.) at 7 p.m., then bar hop via the streetcar, spreading holiday cheer and song to watering holes along the route. If you’re more of a spectator than a singer, St. Louis Cathedral offers nightly concerts throughout December in addition to other holiday concert series around town.